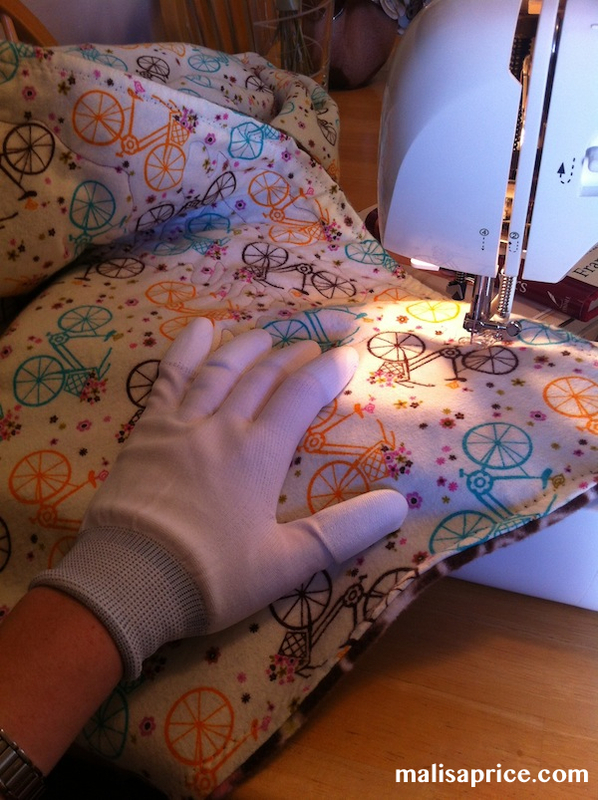 It took a small search party (think Donner Party), for me to find the fabric and order enough to make my own blanket. I planned to use the cream-colored flannel material for the top and a brown fleece material for the bottom. I've shared before how to sew flannel swaddling blankets for baby shower gifts. I planned to use the same method to create this blanket. 1. The cream flannel material was not the same width as the brown fleece material. I facetimed Mandie and asked her how to sew a seam. She told me the best way to proceed. 2. The baby blankets are small enough they won't come apart when you wash them. I figured if I tossed an adult-sized throw blanket in the washing machine, it might lose its shape. While I thought about solutions to finish the blanket, I went to the Sacramento Modern Quilt Guild meeting. The gals there gave me a number of suggestions to quilt the blanket and I signed up for a Free Motion Quilting Class. Once I realized what my blanket pitfalls were, I started cutting and laying out the blanket. You might know of a better method to cut your fabric, but the only thing I could surmise was to lay the blanket on the ground. I should have used kneepads. I didn't realize how many times I would be up and down, down and up, cutting, pinning, cutting again. To make the cream material the same width as the brown material, I created a seam that added about 18 inches. The seam was a lot easier to make than I thought it would be! To create the zig-zag stitch, I used a cream thread for the top and brown for the bottom. I really liked how this made my imperfect lines barely noticeable! I finished the blanket using my Machingers (gloves that help grip the fabric). I quilted with a pink thread on the top and brown thread on the bottom. The finished blanket is 55 inches wide and 65 inches long. The perfect size for both Anthony and me to share while we watch our favorite shows (like Downton Abbey)! Today is a special day, because I'm hosting Try New Adventures Thursday. Alicia normally hosts this fun link party, but she's letting me host the party today! Please share the new things you've tried lately. A few ideas: a new recipe, hair style, adventure, how you save money, etc. In case you're wondering, here's how TNAT got started.